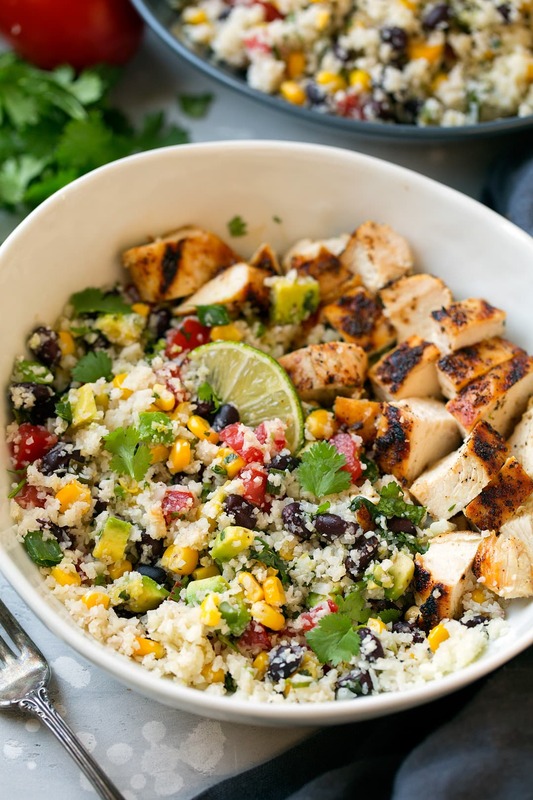 Cilantro Lime Cauliflower Rice – skip the white rice and try this seriously delicious cauliflower “rice” instead! This version is packed with veggies and it has such a bright fresh flavor. It’s a healthy recipe you’ll want to make again and again! 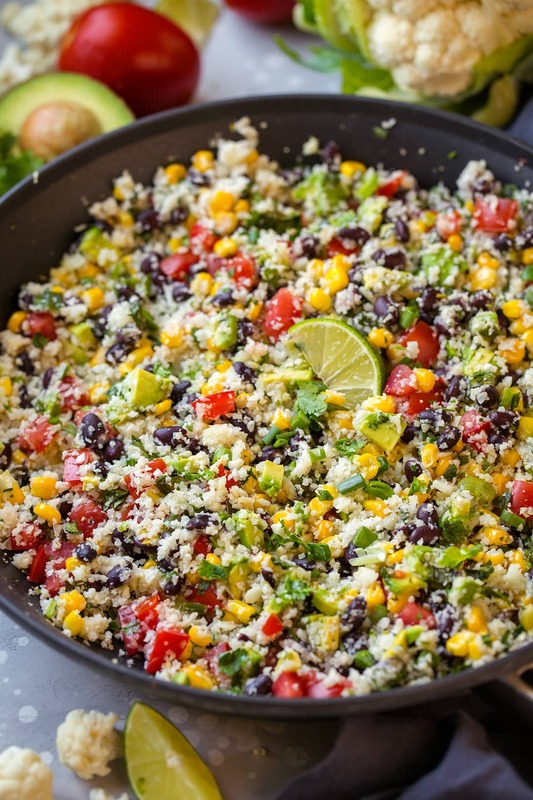 Cauliflower Rice with Fresh Cilantro Lime Favors! 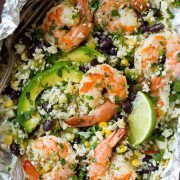 This Loaded Cilantro Lime Cauliflower Rice is packed to the max with goodness (cauliflower, black beans, avocado, corn, tomatoes) and it’s brimming with those Mexican flavors we crave. I’m telling you guys though, cauliflower rice is a low-carb food I actually love and frequently choose over rice. Why has it taken me 30 years of life to discover something so amazing? I know crazy, right? I’m getting excited about cauliflower. I guess it’s just that I’ve always been a fan of white rice but we all know it’s pretty much just an empty carb so finding a healthy and delicious replacement is a big thang. Cut the florets from the cauliflower core. Pulse half at a time in food processor, in 1 second pulses until it’s minced into fine bits, just a bit larger than couscous (you should have about 4 cups). Place cauliflower on a several sheets and layers of paper towels, then wrap and press to remove some of the excess liquid. Set aside. Heat oil in a 12-inch non-stick skillet over medium-high heat. Add onions and garlic and saute 30 seconds. Add in cauliflower “rice” and saute 6 minutes. Add in corn and black beans, season with salt to taste and warm through, about 1 – 2 minutes. Remove from heat. Add tomatoes, avocado, cilantro, lime juice and lime zest and gently toss. Serve warm. And then obviously how do I not turn something so fabulous into a burrito bowl?? It’s just meant to happen. 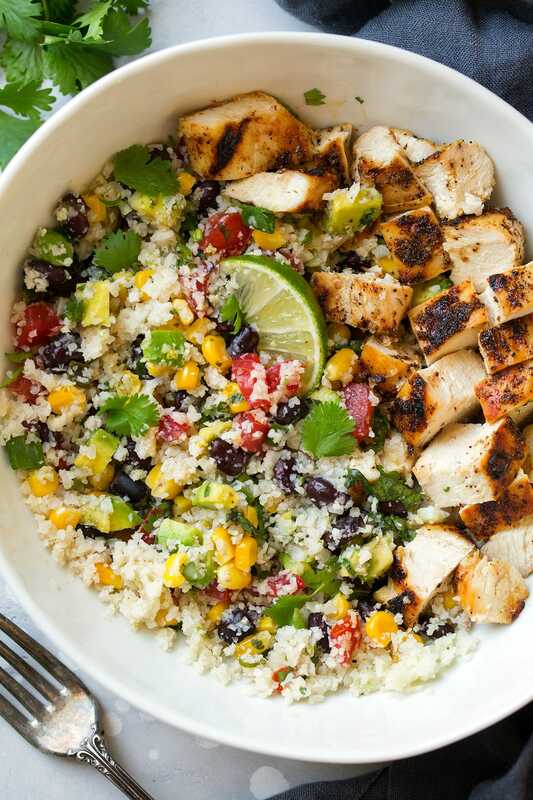 Two of the best things, Mexican seasoned grilled chicken and this healthy “rice” collide to make one healthy unforgettable meal. That you’ll want to make again. And again. And then again. Forever and ever. Why do You Dry the Cauliflower? 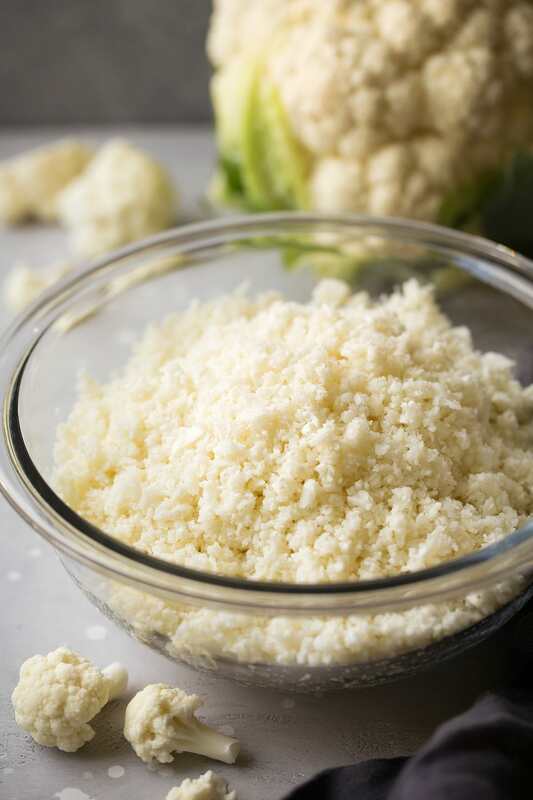 My method for cauliflower rice may seem a little strange, but I’ve found drying the minced cauliflower really does make a difference in the end result. Especially when you are going to be adding in more liquid, like the lime juice here. So I don’t recommend skipping that step. Oh and if you don’t have a food processor you can grate the cauliflower instead. Yes. Frozen Cauliflower Rice will work fine here too. Use 4 cups. 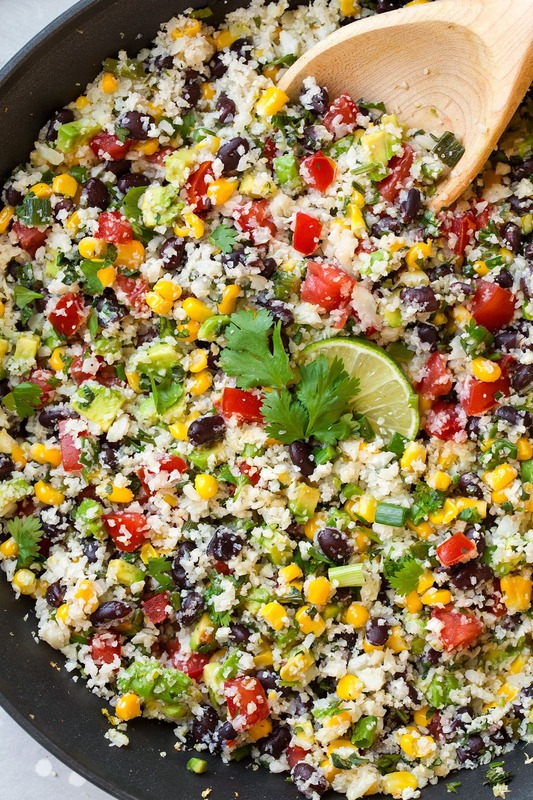 Skip the white rice and try this seriously delicious cauliflower "rice" instead! This version is packed with veggies and flavored with the bright cilantro lime combination. Cut the florets from the cauliflower core. Pulse half at a time in food processor, in 1 second pulses until it's minced into fine bits, just a bit larger than couscous (you should have about 4 cups). Heat oil in a 12-inch non-stick skillet over medium-high heat. Add onions and garlic and saute 30 seconds. Add in cauliflower "rice" and saute 6 minutes. Add in corn and black beans, season with salt to taste and warm through, about 1 - 2 minutes. Remove from heat. 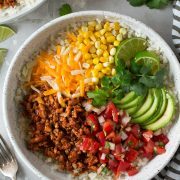 If you'd like to make the rice into chicken burrito bowls - pound 4 (6 oz) chicken breasts to an even thinness. Brush both sides lightly with olive oil and season with S & P. Season both sides with (total) 1 tsp ancho chili powder, 1 tsp ground cumin, 1 tsp garlic powder, 1/8 tsp sugar (for a better char). Grill on preheated 425 degree grill, about 4 minutes per side. Let rest 5 minutes on a plate then cut int cubes. Serve with this "rice", top with Queso fresco cheese if desired.